➤ Water resource and natural hazards management is a crucial societal and financial stake that requires a solid capacity of anticipating systems changes. This capacity relies on the understanding and the prediction of hydrodynamic flows. The anticipation need is also exacerbated by the impact of climate change. ➤ In spite of the significant advances in numerical modelling, hydrodynamics are described with a non-negligible uncertainty range that is linked to the approximate description of hydraulic parameters, meteorological, hydrological and geographical data. These uncertainties translate inevitably into errors in the hydraulic variables that are of interest for the model users and thus limit the predictive capacity of numerical models. ➤ Data Assimilation offers a convenient framework for quantifying and reducing uncertainties in hydraulics models, making the most of in-situ and remote sensing observations. ➤ The Hydrology and Hydraulics research project is part of the MODEST challenge. 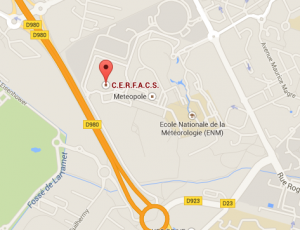 It is at the crossroads of transversal axis at CERFACS such as “Data Assimilation” et “Uncertainty Quantification”. 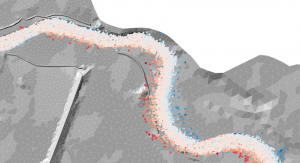 Water level correction for the Adour River with in-situ data assimilation and 1D/2D coupling. PhD S. Barthélémy 2015. * Improve flood forecasting and water resources management capacity using data assimilation for hydrology and hydraulic modeling. * Investigate the use of remote sensing data for hydraulic and hydrology modelling, especially from the up-coming SWOT (CNES, NASA) mission that will allow for unprecedented high resolution and global coverage observation of continental waters. * Provide a methodological framework for multi-dimensional model coupling (1D and 2D) in hydraulics in order to describe complexe hydrodynamic flows while limiting the computational costs using the OpenPALM (CERFACS/ONERA) software and combining coupling and data assimilation. * Improve complex hydrodynamics flow with 2D models. This implies implementing an ensemble-based data assimilation algorithm for the two-dimensional hydraulic model TELEMAC in order to correct the hydraulic state, model parameters and forcing. The ensemble based approach allows to represent flow depending background state error covariances. 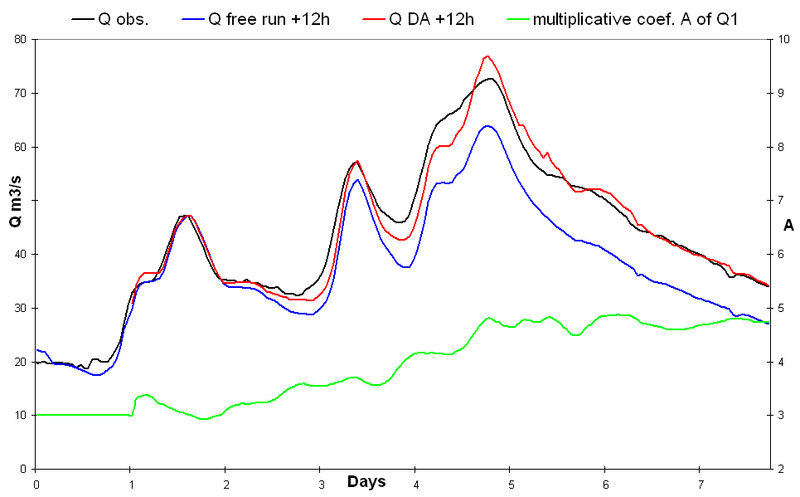 * Combine uncertainty quantification and data assimilation methods, for instance using surrogate models to provide stochastic estimates of error statistics at reduced computational cost. These developments rely on the use of OpenPALM et OpenTurns (EDF/EADS). The Data Assimilation with Mascaret Platform (DAMP) is developed in the framework of a collaboration between SCHAPI, LNHE, CEREMA and CERFACS. It is based on an Extended Kalman Filter algorithm implemented on the 1D hydraulic model MASCARET. It allows for the sequential correction over time of the hydraulic state, the upstream and lateral hydrological forcings and the friction coefficients. A similar platform to DAMP is currently under development for uncertainty quantification. 2016 : PhD defense Johan Habert, January 6th, 2016 : Real time flood forecasting for the Marne catchment area : data assimilation of in-situ data to correct the 1D hydraulic model MASCARET. 2015 : PhD defense Sébastien Barthélémy, May 12th, 2015 : Implementation of an Ensemble Kalman filter for MASCARET for hydraulic state correction over the Adour River and coupling with a local 2D model (Telemac) over the confluence area between the Nive and the Adour rivers. 2014 : Operation use of DAMP at SPC SAMA (PhD Johan Habert) and implementation of DAMP with in the POM at SCHAPI. 2013 : Correction of the salinity tracer field in the Berre lagoon with a variational algorithm implemented on Telemac 3D. 2010 : Preliminary development of DAMP and application to the Adour, Marne and Garonne rivers. GdR EGRIN (Groupement de Recherche, “Ecoulements Gravitaires et RIsques Naturels”). GdR MASCOT-NUM (Groupement de Recherche, “Méthodes d'Analyse Stochastique des COdes et Traitements NUMériques”). 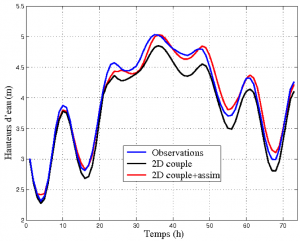 Johan Habert, Sophie Ricci, Olivier Thual, Etienne Le Pape, Andrea Piacentini, Nicole Goutal, Mélanie Rochoux, Reduction of the uncertainties in the water level-discharge relation of a 1D hydraulic model in the context of operational flood forecasting. Journal of Hydrology, HYDROL20865, DOI : 10.1016/j.jhydrol.2015.11.023, , vo. 532, p52–64, 2016. S. Barthélémy, S. Ricci, A. Piacentini, O. Thual, O. Panneckouke, P.-O. Malaterre: Emulation of a Kalman filter algorithm on a flood wave propagation model. Journal of Hydrology. In review. V. Borrell Estupina., P.-O. Malaterre, S. Ricci, P. Fleury, O. Thual, C. Bouvier, A. Marchandise, M. Jay-Allemand, M. Coustau, E. Harader, M. Guilhalmene, J.-C. Maréchal (2014): Flood part II: Genesis, propagation and forecasting of flooding at Montpellier city. Karstologia. Accepted. E. Harader, V. Borrell Estupina, S. Ricci, M. Coustau, O. Thual, A. Piacentini, C. Bouvier : Correcting the radar rainfall forcing of a hydrological model with data assimilation:application to flood forecasting in the Lez Catchment in Southern France. Hydrol. Earth. Syst. Sci. Discuss., 9, 3527-3579, 2012. http://www.hydrol-earth-syst-sci-discuss.net/ç/3527/2012 doi:10.5194/hessd-9-3527-2012, 2012. S. Ricci, A. Piacentini, O. Thual, E. Le Pape, G. Jonville : Correction of upstream flow and hydraulic state with data assimilation on the context of flood forecasting. Submitted to Hydrol. Earth Syst. Sci, 15, 3555-3575, 2011. G. Thirel, E. Martin, J.-F. Mahfouf, S. Massart, S. Ricci, F. Habets : A past discharges assimilation system for ensemble streamflow forecasts over France. Part 1: Description and validation of the assimilation system. Hydrol. Earth Syst. Sci., 14, 1623-1637, 2010. G. Thirel, E. Martin, J.-F. Mahfouf, S. Massart, S. Ricci, F. Regimbeau, F. Habets, 2010: A past discharge assimilation system for ensemble streamflow forecasts over France. Part 2: Impact on the ensemble streamflow forecasts. Hydrol. Earth Syst. Sci., 14, 1639-1653, 2010. Johan Habert. Prévisions des crues en temps réel sur le bassin de la Marne: assimilation in-situ pour la correction du modèle hydraulique mono-dimensionnel Mascaret. INP, à venir Dec. 2015-2016.
crues en temps réel. Application au réseau hydraulique “Adour maritime”. INP, Mai 2015. Elizabeth Harader. L'impact du changement climatique sur les événements hydrologiques extrêmes des petits bassins versants méditerranéens : le cas du bassin versant du Lez, UPS, Janvier 2015. Mathieu Coustau. Contribution à la prévision des crues sur le bassin du Lez : modélisation de la relation pluie-débit en zone karstique et impact de l'assimilation des débits, SIBAGHE, 2011. Séries : Springer Hydrogeology – Goubersville Philippe, Cunge Jean, Caignaert Guy (Eds.) 2014, X, 405p. 324, 2014. V. Borrell-Estupina, B. Ladouche, P.-O. Malaterre, S. Ricci, Y. Caballero, M. Coustau, N. Dorfliger, P. Fleury, M. Jay-Allemand, J.-C. Maréechal, O. Thual : Forecasting and mitigation of flooding in a Mediterranean karstic watershed. Hydrology in a Changing World: Environmental and Human Dimensions. Proceedings of Friend-Water 2014, Hanoi, Vietnam, February 2014, IAHS Publ. 36x, 2014. K. Andreadis, S. Biancamaria, S. Ricci : Preparing for the assimilation of continental water surface elevation imagery from upcoming satellite mission. Hydrologic Data Assimilation for the SWOT mission meeting; Toulouse, France, 12-13 November 2013, Paper 2014ES004574R, EOS, American Geophysical Union, 2013.